Everyone’s always telling you to plan ahead. Plan your classes. Plan for traffic and parking delays on campus. Plan to study for tests and to write term papers. Plan your gym schedule. Plan your work schedule. Plan your future career. Plan your spring break vacation. And of course that old crowd favorite . . .
As a college student, you’ve heard it all by now. And if you’re a sorority treasurer, you know full well the benefits of financial planning. The question isn’t if you should plan for your chapter’s financial future, but how robust your plans should be, how far-reaching and how rooted in the present reality of your sorority budget. On top of everything else a sorority treasurer has to plan for in her life, this level of forward-thinking budgeting can be overwhelming, to say the least. It’s important to take a deep breath, and then take it step by step. Just because you’re not a financial wizard doesn’t mean you can’t plan your chapter’s budget effectively as a sorority treasurer. No matter your level of budgeting prowess, thinking ahead and planning for potential shortfalls and unforeseen challenges will benefit both the expert and the novice treasurers. OmegaFi wants to help you to prepare for The Long Game. Let’s talk about How Far Into the Future Sorority Treasurers Should Plan. The first and foremost consideration as a sorority treasurer plans her chapter’s future budgeting needs is that she is only the latest in a lineage of treasurers going back generations. There have been treasurers before her, and there will be treasurers after her. With this perspective, you can begin to see the budget you’re setting as one part of the chapter’s larger financial reality over time. While you can’t fix the mistakes of past treasurers, you can learn from them as well as build on their successes. Equally important is that you consider what you want to impart when you pass the baton to the next sorority treasurer. Establish a budgeting plan, with the help of your finance committee, that sets up the incoming treasurer to be in as strong a position as possible. This means planning with the intent to create a margin for error in chapter budget expenditures and, ideally, to create a surplus of savings for the next sorority treasurer to incorporate into her budget. When a sorority treasurer plans ahead for budgeting at least through the next treasurer’s term, it gives future generations of treasurers a solid foundation and reduces some of the risk and uncertainty of sorority financial management. How far you actually plan ahead may vary. Some individuals plan their finances a year ahead or more, or simply stick to a monthly budget and make adjustments when necessary. Businesses may plan their finances far into the future, while focusing on their projected costs and earnings on a quarterly basis. Your sorority treasurer will have to figure out how far ahead she wants to plan, but it’s also important to understand which chapter financial goals need immediate attention, and which require longer-term planning. Take it goal by goal, and don’t focus so much on the future that you lose sight of managing the budget in the present semester. For example, your chapter may have a recruiting goal that the budget needs to account for, but you might also have a one-off social event that may fit better in a future semester in order to balance out the bottom line. A good rush week this fall might pay off down the line and make that social event even better with the increase in sisters paying membership dues. It’s always a balance, but if a sorority treasurer always plans ahead with an eye to what’s directly in front of them, chapter finances have a much greater chance of running smoothly. What’re Your Chapter Goals? Use Them to Plan Sorority Finances. For this part of chapter financial planning, we’re going to have to go way back to before you were elected sorority treasurer. We know. It was, like, forever ago. You’ve had a few exams and papers due since then, and it seems like a lifetime has passed. But let’s think back to those days when you were a mere sister dreaming of one day reaping the glory of becoming the next sorority treasurer. You had big ideas. Specific ideas, financial goals. This was your platform. It’s what separated you from the sisters running against you. When you gave your sorority election speech, you shared these goals with your sisters. Some might say the rest is history, but for you the financial future of your chapter is just beginning. When you made those financial goals, they weren’t just empty campaign promises. You really thought them through. They weren’t too few and they weren’t too many ideas, just enough to handle. Once elected, it’s your job to put your focus on completing those goals. Some will be able to be completed within your term, and some you will see grow to fruition in the coming semesters. Think about what made these goals so compelling to sisters in the first place. Likely, they got your chapter mates’ attention because they make perfect sense within the chapter’s goals. You’ve considered your chapter’s budgeting weaknesses and strengths, what areas need the most work, and you’ve shown your sisters that you plan to make positive strides as treasurer. However far ahead you plan your chapter’s budgeting needs, you should keep in mind the generations of treasurers before and after you, and make sure that current budgeting goals are nested within specific chapter goals. Are you prepared for the long game? 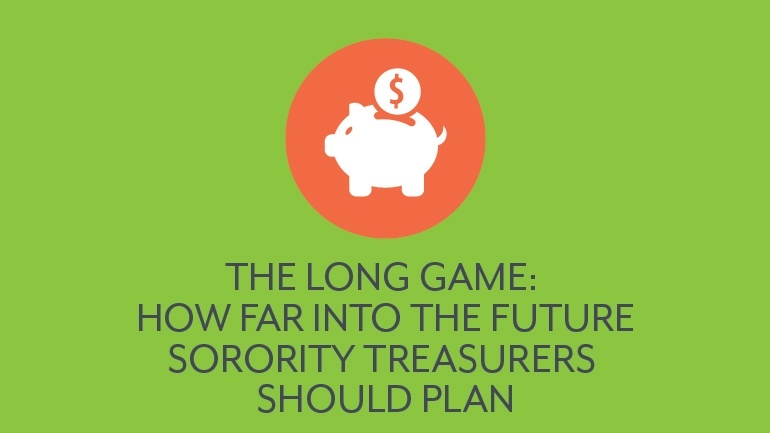 How does your sorority treasurer plan for the future? Lay it down for us in the comments below.